"I came up with this idea one day while eating a calzone with a side of Jalapeno Poppers. I thought a jalapeno popper pizza would be awesome. I came home and searched online for a recipe like the one I had in mind and found recipes for jalapeno popper pizzas, but none quite like my idea. We tried it this evening and found it to be delicious and EASY!! This would also make a great appetizer sliced into small squares. Can't wait to try this with different meats, like sausage or ham!" Stir together the softened cream cheese and ranch dressing mix in a bowl until smooth. Spread the mixture on the pre-baked crust. 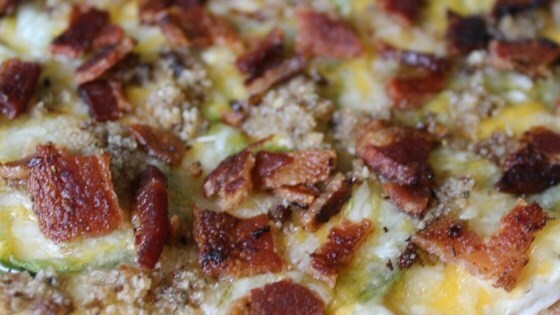 Sprinkle the jalapeno slices and bacon on top of the cream cheese mixture; then top with the shredded cheese. Combine the melted butter and seasoned bread crumbs. Sprinkle the mixture over the top of the pizza. Bake in preheated oven until the bread crumbs are nicely browned and the cheese has melted, about 15 minutes. Learn how to make a unique version of homemade pizza. The filling was great but the topping destroyed it for us. Recommend using crumbled Ritz Crackers instead of the breadcrumbs. This was so good. My family really enjoyed it. I used 2 pre cooked flat breads and it was just perfect!! Thanks for sharing this recipe. Quite different, but a wonderful combi. Thanks so much. Absolutely awesome pizza! Have made 4 times at least in the last month & making again for my sister tomorrow.